A voting method is vulnerable to vote splitting when having multiple similar candidates reduces the chance of winning for any of the similar candidates, but increases the chance of winning for a dissimilar candidate. There are two kinds of vote splitting: primary (structural) and secondary (strategic). Structural vote splitting occurs because voters cannot express the support that they feel for a candidate. Strategic vote splitting occurs when voters choose to express less support than they feel for a candidate. 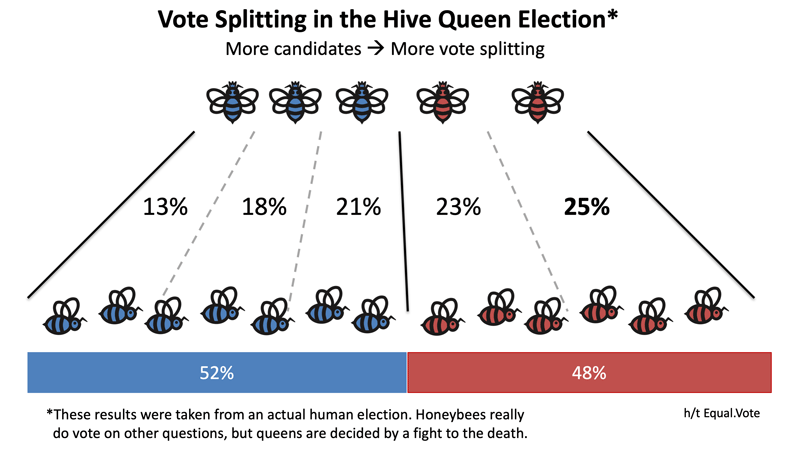 Structural vote splitting is most obvious in allocative voting methods, where each voter has a fixed amount of vote to give, so similar voters are forced to dilute their vote among similar candidates. Structural vote splitting can be defined in terms of various mathematical criteria, e.g. the Equality Criterion, Clone Independence, and Independence from Irrelevant Alternatives. For example, “A voting method passes the Equality Criterion if every possible vote expression has a counter-balancing vote expression and if the counting system produces the same election outcome when any pairing of a vote expression and its counter-balancing vote expression are added to the tally.” You can read the details about these criteria elsewhere. Strategic vote splitting occurs when people vote not their real opinion, but based on how they expect other voters to vote, which is in turn based on available pre-election polling information and coordination. Some groups or factions, in some electorates, in some elections, may be more likely to vote strategically than others. Sometimes strategic voting is actually good: voting for a front-runner over one’s favorite actually reduces the chances of vote splitting. Strategic vote splitting is related to other criteria, notably the Favorite Betrayal Criterion and the Later No Harm Criterion. There are some well-known forms of strategic vote splitting, e.g. the Chicken Dilemma and the “Dark Horse plus 3 rivals” (DH3) pathology. You can read the details about these strategic-voting cases elsewhere. Discussions of the impact of structural vote splitting are somewhat speculative, based on the likelihood of various scenarios of voter preference distributions. Discussions of strategic vote splitting are highly speculative, based on the likelihood of both voter preferences and voter behavior. Take with a grain of salt any strong predictions of what will happen in a given election under a given voting method. Fortunately there is a solution: evaluative voting methods, where voters rate candidates independently on a scale. Evaluative voting methods are highly resistant to structural vote splitting, and variations can discourage strategic voting and consequent vote splitting. Best of all, they are simple, and voters are already generally familiar with them.